We have a long retaining wall in the garden which we wanted to clad in stone. The architect recommended a drystane effect but neither my wife nor I liked that idea and we wanted something less rustic. We ordered coursed sandstone and the builders have started to put it up, but the stone that came is just very very yellow. My wife has decided that she doesn't like it and I can see her point. She thinks the issue is that the sandstone pavers are not uniformly yellow. 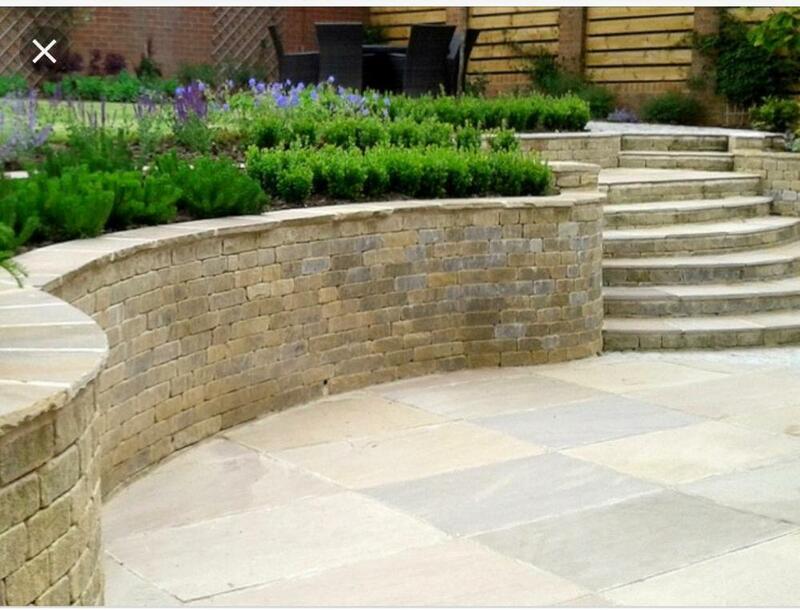 We thought they were going to be yellow when they were ordered but they ended up being mixed sandstone. For some reason getting proper samples out of people seems to be an ongoing issue. Last week we refused to let the driveway get done in resin bound stone until we had an actual sample that we liked and a full bag of it, not a 2 inch square sample in a box that bears no relation to the actual colour. 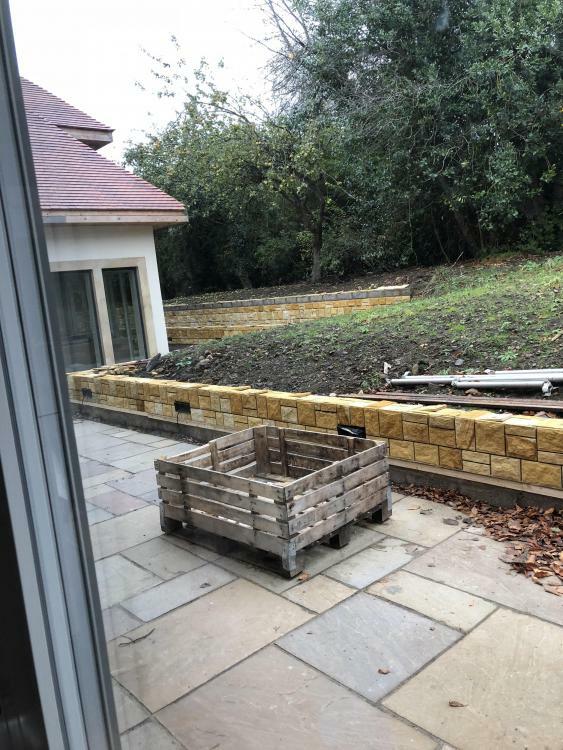 Anyway, having looked at it I don't think the pavers are the problem, I think the problem is that the colour is too yellow and that it is too many different finishes. I suggested changing it to ashlar stone to match the house, however, having spoken to the architect he suggested rendering it with a sandstone cope to match the house. This I think would look the best but has issues with staining which is why we didn't do it to begin with. I have a picture of the part complete wall and a picture of a rendered wall with staining issues which we want to avoid. i would agree and wall stone looks dated already! though on the plus side you will soon have a visit a tin man, lion,and scarecrow! It will tone down with the sun but it won't happen quick. I have gold stone cladding on the north and south faces of my build and the south is a lot lighter in colour but mine is up 4 years now. I agree with your wife that colour stone looks very wrong. There is a product called Liquid Weather, that I know nothing about but the name. Or could you try something natural to stain it and encourage lichen etc? Paint it with some yoghurt? A neighbour years back had an extension built and the new roof tiles really stood out against the old. He spread manure over both sets of tiles! Hmmm that might be at least worth a try. I might buy a sample. My wife is quite undecided and now says she might prefer something more rustic tan render like this. She also wants it fixed as quickly as possible. It is very difficult to know how it will look finished. I am worried about having too many materials and colours. Reading about yoghurt and the Liquidweather they seem to be designed to darken things up to look like dirty old sandstone. Here I need to make it lighter probably, which I don't think is possible. I don't know what applying acid would do. Your problem there is that the sandstone is the same colour all the way through ... so it will wear back to the colour you do not like 🙈🙉🙊. Could you alter the perception by repointing the mortar? I confess that I am still not *absolutely* clear which one you really want to change - the wall or the paving. 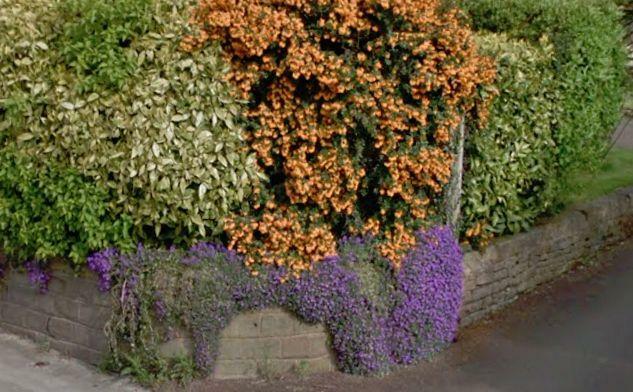 Taking another tack, what about overhanging planting on the wall? It does rusticate it very effectively in a relatively short time. Personally I would do that and spend the 'perfectionising' money on a holiday or possibly a mistress. 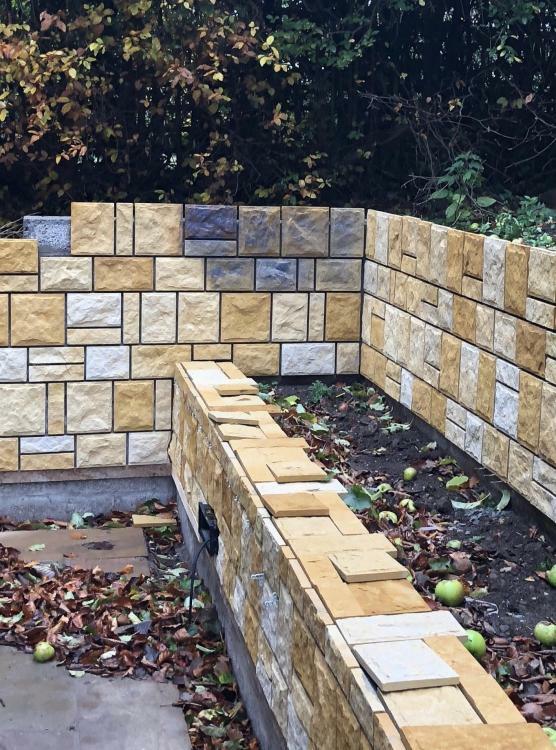 It is the sandstone wall we want to change. It is easier and cheaper! The wall is a block wall and they are sandstone slips that the builders have been putting on it. We did not expect them to be so yellow when they arrived. In hindsight, probably should have stacked some up to see what they looked like rather than letting them just get on with putting them on. It hasn't been pointed yet so that might probably help.But ultimately they are too bright. The Liquid Weather would make them a lot darker I think, so we have ordered a sample of it. @Ferdinand is right about the planting, there is one area where we had planned to have plants hanging over the wall and that area we might not change. If you make the plants ivy it would vanish forever in a couple of years. Liquid Weather turned it purple! Decision has been made to render the wall. Thankfully, this should be the last unexpected bill. Oh go on, show us a picture!!! It reminds me of two of my sisters in law. When was staying over with the other, the hostess didn't tell her sister that the bottle of shampoo in the shower had red tint in it. The guest sister had completely white hair. Before she used the shampoo. It turned a lovely shade of pink afterwards and lingered for a good two weeks. So what colour are you going to render it ? Off white with a sandstone cope, same as the house. I am worried about the cost of the copes. Luckily they do sample bottles! Have the quote on for rendering the wall. Unfortunately some idiot (me) decided to only use real stone for the house. For the garden walls to match we have to use the same sandstone for the copes. This includes a circular seating area. I was hoping to get away with sandstone slabs cut to size but it wouldn’t have looked right. Not for the first time I have been told that I can’t spoil the look of the house by using something cheap. 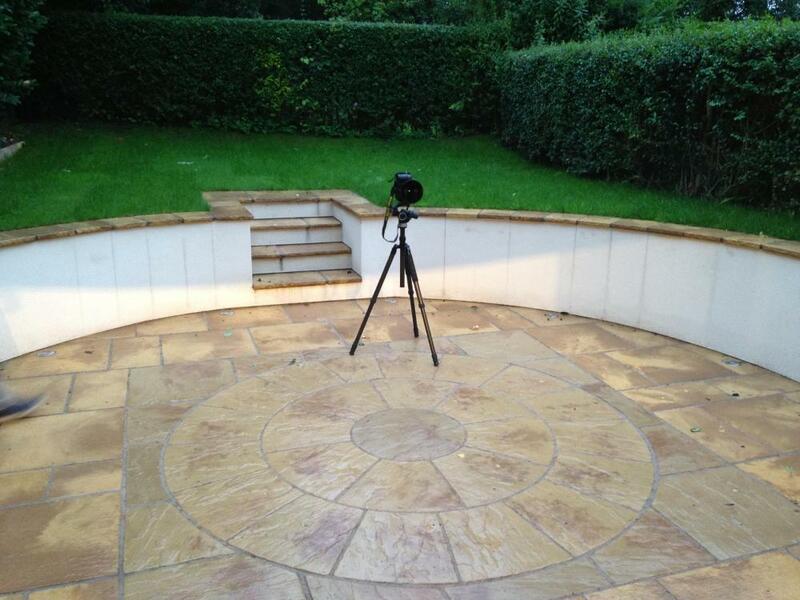 So over £10k for around 100 linear metres of coping stones fitted. I didn’t realise when we started that having a small slope to the site would cause such an enormous extra landscaping cost.